Shanna O'Hara is a former Olympic athlete and a licensed veterinarian, and she has made the Savage Land her adopted home. Her fierce hatred of firearms arose from the accidental shooting death of her mother. This Shanna is based on Frank Cho's redesign of the character, so it could probably serve double-duty as his "original" character Jungle Girl, as well. She's blonde, and her animal-skin bikini top is painted on. She has different kinds of cuffs on both wrists, and her loincloth/belt/sheath combo is a single molded piece that fits over the waist. She's got a great angry look on her face, and is armed with both a spear and a big knife. But no guns. Like the bio said. In the Savage Land, the skies are owned by the Reapers, giant pterodactyls who resemble X-Men villain Sauron. When they attack Wolverine and Shanna, they quickly learn that the pair are not easy prey. Wow, this isn't Sauron? I figured they were just not calling him Sauron because, you know, "Sauron." 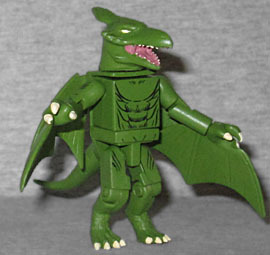 He's built like a Battle Beast, with Lizard legs, a tail that plugs into a specialized back piece, and cool new hands that have half his wings hanging off them. The head is a bit more spiky than you expect from Sauron, but this is still a good stand-in. He comes with a special display stand that's been shaved down to fit in his ultra-small foot hole. This particular set is based on the first storyarc in Savage Wolverine, which saw Logan team up with Shanna and an inexplicably adult Amadeus Cho to escape an island in the Savage Land. Yes, there were a whole bunch of Saurons Reapers in the story. That's why the TRU Minimates released around the same time as Series 51 included a Wolverine & Reaper set, so you could army-build; but given the choice between Shanna and Wolverine (and knowing that you only need one Sauron), who would ever choose the short hairy guy over the tall blonde with the spear? This entry was posted in Art Asylum, Marvel, MMMR and tagged Minimates. Bookmark the permalink. God, I have that Jungle Girl GN, because I saw Cho's name on the cover and thought, "ooh! More Shanna!" Nope. Cho just did the covers for the individual issues. Everything else was some other guys, and...not that great. And Shanna's stance on guns must have changed, because one of the first things she does in "Savage Wolverine" is drop a Reaper out of the sky with an assault rifle. I know, right? Cho writes Jungle Girl, I believe, but it still feels like a bait-and-switch to put him on covers and then not let him draw it. That's because it's the new Shanna from Cho's relaunch mini. Instead of being Shanna O'Hara, she's a Nazi genetic experiment from the Savage Land. She's blonde with a snakeskin bikini unlike the classic Shanna who's a ginger in a leopard bikini. Hasbro & DST act as if they're the same person even though only one is married to Ka-Zar. Do triple duty as his other original character Jungle Queen.